The Rapido T Universal Concealed Thermostatic Mixer is designed to be used in combination with Grohe trim sets. The corrosion resistant brass body make this mixer extremly durable and comes with a stable built-in-box and protective cap. The mixer features GROHE TurboStat technology that ensures an instant water flow at the desired temperature and keeps it constant irrespective of any fluctuations in water pressure or supply. 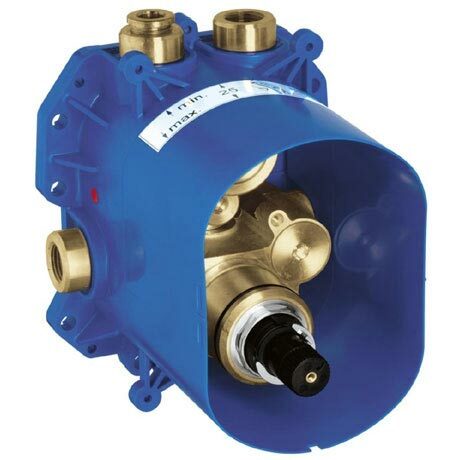 The Rapido T is safe and easy to install and is suitable for water systems with a minimum pressure of 1.0 bar. Q. does this sit IN the wall behind the shower thermostat? "Good quality, Quick delivery, Great service."